Every year about this time, I question my sanity. Tomatoes are ripening so fast on my vines that I can’t keep up with them. Trays of beautiful, red, orange, yellow and purple heirlooms crowd my kitchen counters. When it comes to planting tomatoes, I have no common sense. In the spring, all I can think about is the incomparable flavor of a warm, ripe tomato just plucked from the vine, the pleasant jolt of acid balanced by sweet, juicy flesh. I adore Cherokee Purples with their smoky undercurrent and hint of salt. But it’s hard to resist the sunny sweetness of the beautiful yellow and orange Big Rainbow streaked with red. And I keep trying for a decent crop of the finicky Brandywines despite years of failure. We only eat tomatoes when they’re in season, so by the time August rolls around, we’re ravenous. Sometimes we try to get a jump on the season with early tomatoes from the farmers market, but they’re rarely as deeply flavored and juicy. I do have a weakness for dry-farmed Early Girls from Dirty Girl Produce in Santa Cruz, but grocery store tomatoes are almost always a disappointment. Still, by mid-September, we’ve already eaten our share of sliced tomatoes, BLTs, caprese and panzanella salads. My husband and I will can some salsa, dry a couple of batches and make a basic spaghetti sauce in the slow cooker to freeze for later. Yet we’re always looking for a new dish, something simple and easy that puts the focus on the tomatoes. This year, that dish is the tomato tart from Lynne Rossetto Kaspar and Sally Swift’s terrific new cookbook, The Splendid Table’s How to Eat Supper (Clarkson Potter, 2008). Kaspar is the popular, folksy host of the public radio food show, The Splendid Table. It airs on KAZU (90.3 FM) in the Monterey Bay Area Sundays at 2 p.m. The tart is dead simple. It’s made with frozen puff pastry straight from the supermarket freezer case, which is a real boon for pastry phobes. Layers of tomato, red onion, goat cheese, garlic basil and thyme are highlighted with a generous sprinkling of fresh lemon zest. It tastes like summer on a plate. I’ve adapted the recipe slightly to add the crunch of toasted pine nuts. I wrote about this wonderful tart in the Mercury News last month, but I’m revisiting it because a number of readers – and a couple of friends – complained that their tarts burned at the high heat called for in the recipe. Although the tarts I baked in my gas oven turned out nicely browned and crisp, it was apparent that 500 degrees is just too hot for many ovens. One problem may be that some cooks have no idea how hot their ovens get when they set the temperature. For years, my cakes and cookies took far longer to bake than any recipe recommended. Then I got an oven thermometer and discovered my oven was running some 50 degrees cooler than the temperature indicated on its dial. When we called in a repairman, he contended that such variations are common. Now I keep a simple dial thermometer in my oven at all times. It’s a much cheaper option than constantly recalibrating the oven. Since many ovens have hot spots, it’s best to shift the thermometer to the location where you will be baking or roasting and adjust your oven’s temperature dial as needed. The other issue is time. At temperatures this high, it’s crucial to keep an eye on the tart, not just set the timer and forget it. It may take a couple of minutes less, depending on your oven. Nonetheless, it seemed prudent to see if the tart would turn out as well at a lower temperature. I baked yet another tart at 450 degrees and it still won praise from guests. It wasn’t quite as crisp on the bottom but the crust was golden and buttery. It’s definitely an option. This tart is too good to miss because your oven has a temperature of its own. 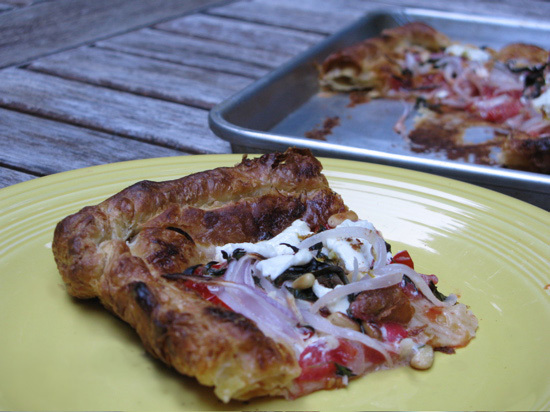 On a large, ungreased cookie sheet, lay out the pastry sheets side by side so they overlap by ¼ inch. Press the overlapping edges together to seal. Create a rim by folding the pastry edges up and over on themselves and pinching them together. You’ll end up with a rectangle about 7½ inches by 17 inches. Place tomato slices in a single layer covering the tart. Cover with onion slivers. Scatter with garlic, herbs, lemon zest, salt and pepper. Drizzle with olive oil. Zigzag cream in ribbons over the tart. Bake on bottom rack of oven for about 15 minutes, until tart is just beginning to brown. Remove, distribute goat cheese over tart and sprinkle with pine nuts. Bake for about 6-8 minutes more, watching carefully to avoid burning. The cheese should begin to pick up color. Pull tart from oven, let stand for a few minutes and then cut into 8 squares. Serve immediately or let cool and serve at room temperature. Adapted from “The Spendid Table’s How to Eat Supper,” by Lynne Rossetto Kasper and Sally Swift. wow, this looks scrumptious! i have a bumper crop of tomatoes this year so will definitely try it. but i have a question for you: what do i do with all my green tomatoes? 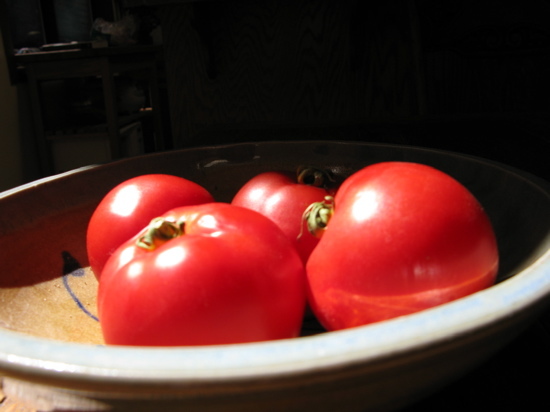 i brought some in the house and it looks like they’re starting to turn red, but i don’t know if all of them will do that, or if they’ll taste anything like vine-ripened tomatoes when they’re done turning. Tomatoes picked green will never taste like the vine-ripened one. So why don’t you make the most of their sour, acid nature and use them for a green tomato chutney or perhaps some green tomato pickles. The classic, of course, is fried green tomatoes.